The classic games of the Atari coin-op world have previously been well established. 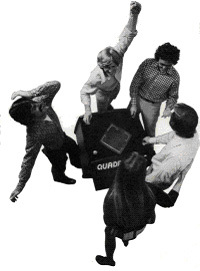 Books like The First Quarter explain the history of games like Pong, Breakout! and Asteroids in lurid detail, but leave out many of the games Atari produced in-between. Of the many recent â€œAtari Classicsâ€ game collections released by Hasbro and Infogrames (now using the Atari name), very little of this early history is covered. Most of these early arcade coin-ops were designed as discreet logic machines built out of individual integrated circuits with no microprocessor. This makes them very hard to emulate with applications like MAME because each game is essentially its own virtual machine that must be programmed and tailored for a single title. Added to that is the belief that many of these lost games are simple evolutions of Pong, so you can see why the games are almost universally dismissed. Why take the time to create a system to emulate a single, uninteresting Pong variant, when you could just as easily emulate a microprocessor that can play hundreds of games? However, a closer look at these very early games reveals some salient points of interest. Each game that Atari released was an evolutionary step towards a revolution: game play was more complex, controls more precise, graphics a bit sharper, the hardware more elegant, the cabinets more functional, the marketing more targeted. Further, while many think the first successful arcade conversion for the Atari 2600 Video Computer System (VCS) was Taitoâ€™s Space Invaders, this is simply not the truth. A good percentage of the original 2600 cartridge library was based on classic Atari coin-ops created from these â€œlostâ€ years. We will explore these arcade coin-op games year-by-year. Note: Look for the graphic above within the timeline, as this denotes the known or possible roots of famous Atari 2600 games. 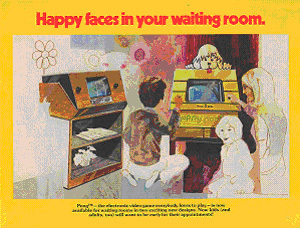 Nolan Bushnell created the first coin-op videogame in his daughterâ€™s bedroom in 1971 while working for Ampex. Inspired by Steve Russellâ€™s Space War, a game he played on the DEC PDP-1 at the University of Utah in the 1960â€™s, Bushnell worked on his own way to bring the computer game experience to the masses. The largest technical hurdle he faced was inventing a way to fit a game designed to run on a mini-computer that cost hundreds of thousands of dollars into a marketable product that was as affordable as a pinball machine. His brilliant breakthrough was deciding to use discreet logic chips to design the game instead of a microprocessor. This process of creating a game in discreet logic involved assembling individual logic chips on printed circuit boards. The game was programmed completely in hardware. In essence, a discreet logic game was a computer designed for one purpose and one purpose only. While this idea might have seemed like a step backwards to computer engineers, a genius like Bushnell knew it was exactly the solution he was seeking. Bushnell sold his idea to Nutting and Associates, and in late 1971 they attempted to sell and market the game as Computer Space. Nutting had been very successful with a Quiz Show coin-operated game earlier that year, and hoped Computer Space would help them become the leaders in a new market. However, that was not to be. Computer Space landed with a resounding thud. Amusement operators at the 1971 AMOA (Amusement & Music Operators Association) show in Chicago were confused by Computer Space. They were used to buying jukeboxes and pinball machines and had no idea what to do with a videogame. The controls were too complicated and the game too confusing for the average bar room (read: drunk) player. However, the initial failure of Bushnellâ€™s invention did not predict the meteoric rise to success that would soon follow. He had devised a way to make videogames available to the common person and was about to create an entire industry in the process. While still working for Nutting, Bushnell visited Magnavox to take a look at the TV videogame system that Ralph Baer had developed for the company. Magnavox had invited interested parties in the electronics industry to try to drum-up enthusiasm for their newest technological breakthrough. The Magnavox Odyssey could play several simple games on a TV, but required real world pieces like dice and playing cards. The game system was designed around an analog computer, which was a computer used for applications that required a continuous change of one or more variables, usually based on the then new idea of an IC amplifier circuit (although tube-based systems had been in use for years). Bushnell left unimpressed as the games did not inspire him and the visuals looked fuzzy. However, the inclusion of a ping-pong style game in the demo would come back to haunt him years later. Bushnell, desiring more profits from his games, quit Nutting Associates and formed his own company with Ted Dabney. Bushnell founded Atari's forerunner, Syzygy Corp., with $250 from his savings account, some of it earned from Computer Space at Nutting and Associates. Ted Dabney also contributed $250. When the duo found out the name Syzygy was already taken, they chose the name Atari instead (Atari roughly translates to â€œyou are about to be engulfedâ€, which comes from the traditional game of GO). The first use of Atariâ€™s signature logo or mark; the Fuji Symbol ( ), was registered on June 1, 1973. 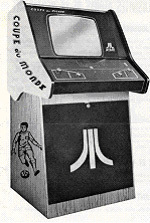 According to Atariâ€™s trademark registration, it was a design â€œconsisting of a stylized representation of Mount Fujiyamaâ€ (Mount Fujiyama, which overlooks Tokyo, Japan, is actually the incorrect way to say its name as the word â€œYamaâ€ in Japanese means â€œmountainâ€ already, so native Japanese usually call it â€œ"Fuji-san"). It is interesting to note, the name Syzygy was not jettisoned as early as one would believe. 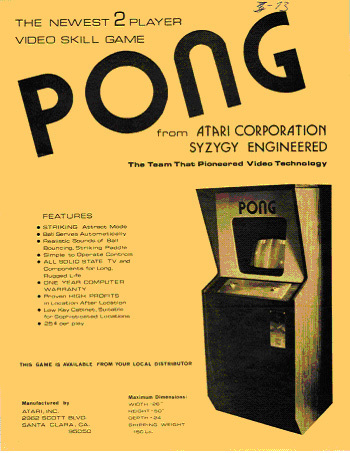 Early flyers for Pong described the game as â€œFrom Atari Corporation, Syzygy Engineered.â€. Nutting and Associates did not stop making videogames after Bushnell left to start Atari. Billing themselves as the place â€œWhere videogame technology beganâ€, they went on to create the pong variants Computer Space Ball, Table Tennis, Table Tennis 2, Ric-o-chet and Paddle Derby, as well as one of the first shoot-em-up videogames, Missile Radar. Their most interesting contribution to videogame history was Watergate Caper, a safecracker/code breaker game released in 1973. In case anyone is mistaken in thinking Grand Theft Auto was the first videogame to have players willingly commit a felony, Watergate Caper tempted gamers to â€œBreak Into Watergate Yourselfâ€ 30 years prior. Nuttingâ€™s own literature bragged that the game â€œsimulates the larceny in all of us to break in and not get caughtâ€. The companyâ€™s last entry in the videogame arena was Wimbledon, a full-color version of pong, released in 1974. Dave Nutting went on to work as a contractor for Midway starting in 1975, where he helped produce the first microprocessor-based videogame (Intel 8080), Gun Fight (Strange Fact: This game started at Taito Corp., as a discrete logic game, and was bought and converted to the Intel 8080 by Nutting -ed.). He then went on to design and program two of the best coin-ops from the golden age, Gorf and Wizard of Wor. While Bushnell kept Atari in the black by servicing and leasing pinball machines, he hired Al Alcorn, a fellow engineer from Ampex, to develop another videogame. Nolan Bushnell lied to Al Alcorn about having a contract with GE for home Pong to lure him into working for Atari. At first, Bushnell wanted to create a driving game as he had a contract with Bally to do just that, but decided to have Alcorn work on something simple first. The primitive ping-pong game he had seen at Magnavox seemed like a good candidate, but had to be improved. Neither Alcorn nor Bushnell were impressed with Odyssey and its analog components. In any event, Pong was only practice and Bushnell was not planning to take it seriously. Just like Computer Space, Pong was a discreet logic machine. It had no microprocessor, but instead used individual integrated circuits to create the logic for the game. The key to saving money was designing the game so well that it used the fewest number of chips. Alcorn added small details like â€œEnglishâ€ and simulated physics that went beyond Bushnellâ€™s original concept, but still kept the circuit board design elegant and cheap. The first Pong game is placed in Andy Cappâ€™s Tavern in Sunnyvale, California. People started lining up before the bar opened just to play the game. In some cases, patrons wouldnâ€™t order any drinks at all, but just went in to play Pong. 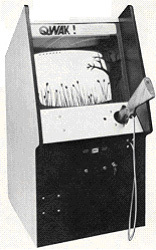 Bushnellâ€™s goal was for Pong to be designed to be as easy as possible to play. Instead of the pages of instructions for Computer Space, Pong instructions were the model of simplicity: "Avoid missing ball for high score." Two weeks after installing the game, Al Alcorn received a late-night phone call from the manager of the bar. T he game had broken down and he wondered if Alcorn could come fix it. When Alcorn arrived to check the machine, he found a most unusual problemâ€”there were so many quarters jammed into the coin drop that the game had stopped working. Under the coin drop was a plastic milk jug with the top cut off, and it was so filled with quarters that the â€œcreditâ€ mechanism could no longer work! The Pong game was offered to Bally first in lieu of a driving game, but they declined to purchase it as they wanted something that didnâ€™t require two players. Amusement manufacturers didnâ€™t â€œget itâ€ either. In 1972, pinball and other amusement game manufacturers made machines with many electromechanical and moving parts. Pong had only two moving parts and this baffled them. Few manufacturers could understand or envision the industry changing. Instead of pursuing established manufacturers, Bushnell decided to manufacture Pong himself. It was his boldest move yet and would ultimately prove successful. He leased an old roller rink in Santa Clara and converted it into a production line. The first Pong game shipped from this facility in November 1972. Bushnell filed a patent for the Pong on-screen control mechanism on November 24, 1972 (US Patent 3,793,483), but not for the game itself. Bushnell distributed Pong along the pre-existing arcade routes he and Ted Dabney had worked to keep Atari afloat while their first game was being created. Each machine took in around $200 a week, which was nearly four times what other (pinball) games and jukeboxes took in on the same routes. Carl Sagan wrote of Pong, "As a result of Pong, a player can gain a deep intuitive understanding of the simplest Newtonian physics." The day Pong was released is marked by the coin-op industry as the first nail in the coffin of pinball. By March of 1973, Pong was deemed a bona fide phenomenon for Atari, Inc. They had sold 6,000 machine and would eventually sell upwards of 35,000. A Pong machine cost about $300 - $400 to manufacture, but sold for $1200, handing Bushnell and Atari a tidy profit. In one year, Atari made a little over $3.2 million. However, there was a black side to this fortune. Atari never patented the design for Pong. Since the game was designed using discreet logic, there was very little they could do to protect their intellectual property. Anyone who owned a machine could open it up, examine the circuit board and copy it chip for chip. By the end of 1973, there were so many competitors selling Pong-style games, that Atari was no longer the leading manufacturer of its own product. Some of the copies were made so well, they looked exactly like the original Atari versions. Bushnell described the Pong competition as â€œThe Jackalsâ€. He said later, "We sold fewer games of the Pong type than anybody else, because we didn't have the cash to produce what the market demanded.â€ By the end of 1973, Midway had sold 9,000 Pong-type machines as opposed to Atariâ€™s 6,000. However, it wasnâ€™t just the copycats Atari had to worry about; there were legal problems as well. Magnavox and Ralph Baer did not take kindly to the success of Atariâ€™s Pong, especially since they had created a very similar game more than a year earlier. They took Atari to court, suing them over Pong. Magnavox used the sign-in-sheet for the 1972 brown-box demo that Bushnell attended as proof that he saw the idea for Pong before he came up with the concept on his own. Skillfully, Nolan turned this legal problem into an advantage for Atari. He settled with Magnavox and the case never went to court. 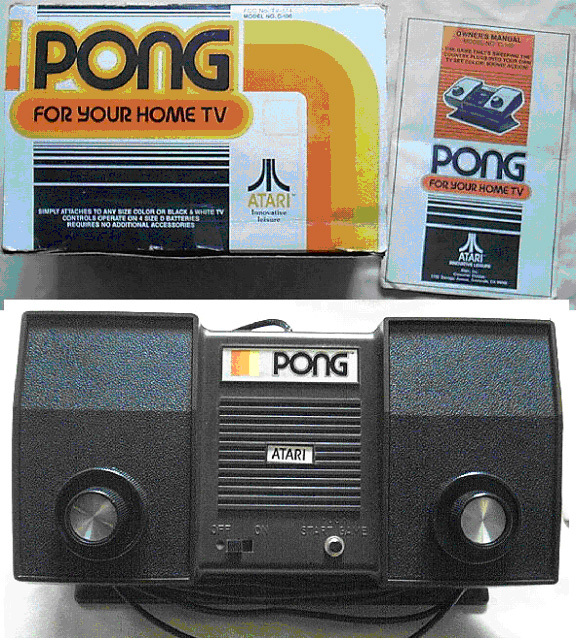 Atari paid a licensing fee close to $800,000 and became the sole licensor of Pong from Magnavox. Magnavox then agreed to go after all of Atariâ€™s competitors as part of the deal, which basically freed Atari to create new and different games while the competition was stuck in court. With so much competition, how did Atari survive these early years? There were two ways. First, they used an early version of â€œJust-In-Timeâ€ manufacturing processes. Nolan Bushnell described it this way, saying â€œWith expensive parts, such as cabinets, we tried to get them out the same day they came in â€¦ we made sure that 75% of the cost turned over in less than a week." Secondly, Atari also took advantage of the soaring demand for Pong by insisting on cash payments from distributors instead of going with the longer terms common at the time in the coin-operated game industry. Steve Bristow was hired by Atari from Ampex in June of 1973. Bristow was a very skilled engineer, who would go on to have a much storied career at Atari. Bristowâ€™s first job was to collect quarters along the arcade routes. Collecting money in the early hours of the morning proved to be a dangerous job. He wasnâ€™t allowed to carry a gun, so he carried a hatchet as he and his wife collected the large sums of quarters. 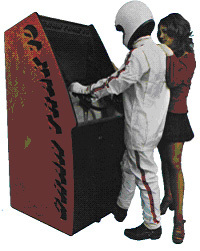 With Space Race, Atari started to advertise their trademarked â€œDurastressâ€ technology, which was a marketing term for how their cabinets and solid-state electronics were built. They claimed their machines were built to meet â€œMilitary Specification 883â€ in their brochures and advertising flyers for distributors and operators. This practice would continue into the mid-1970â€™s. â€œMilitary Specification 883â€ is defined by the Department of Defense â€œStandard Test Methods and Procedures for Microelectronicsâ€, and was a requirement for defense contractors. This surely did not apply to videogames, but it looked good in the advertising! 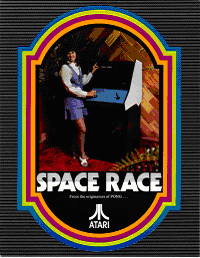 Space Race, Atari Inc.â€™s second coin-op, was a two player only game designed by Al Alcorn. This was a timed game involving two ships flying towards the top of the screen. Players controlled the vertical position of the ships and attempted to dodge an asteroid to get to the top and receive a point. The service manual has Pong scratched out and Space Race written over it. The machine is basically Pong with different ICâ€™s. Atari licensed the game to Bally/Midway under the name Asteroid. The hardware was created with discreet logic chips. The ROM for the ship was graphics constructed out of diodes. The game was advertised as Dura-stressâ„¢ and marketed with the Innovative leisureâ„¢ slogan. With Competition heating up from the pinball industry and other upstarts, Atari innovated with their own four player version of Pong named Pong Doubles (Atariâ€™s third game, according to Atari historian, Curt Vendal). The hardware was a discreet logic design. 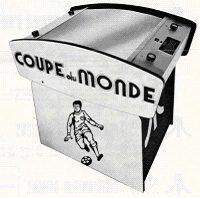 The game was also released in Europe by Atari France as Coupe Davis. A sequel to Coupe Davis was released in Europe in 1974 as Coupe Franc. 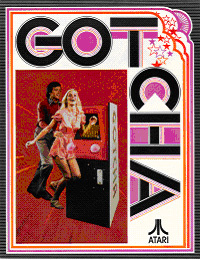 Gotcha was a black and white maze game for two players, designed by Al Alcorn and Nolan Bushnell. One player chased the other through a maze. The maze was an ever shifting wall pattern. As the chaser got closer to the chasee, a tone became more and more frequent. A â€œcatchâ€ scored the pursuer a point. The hardware was a discreet logic design, advertised as Durastressâ„¢ and marketed with Atariâ€™s Innovative leisureâ„¢ slogan. With this game, Atari tested another short-lived marketing slogan, â€œAnother innovative winner from Atari, the leader in video skill gamesâ€. 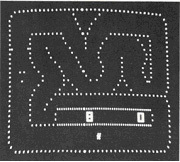 In November of 1973, Atari was granted a patent for the innovation of generating moving symbols on a screen. Atari hoped this patent would help keep competitors from creating carbon copies of their games by copying their discreet logic chip designs. After one year of operations in November 1973, Atari had built and sold 6,000 Pong machines. Sales were about $1,000,000 a month, with $15,000,000 in sales expected by the end of the fiscal year (June 1974). Atari attended the 1973 AMOA (Amusement & Music Operators Association) show in Chicago in November. 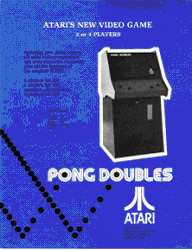 Unlike two years prior with Computer Space, Atari generated a frenzy of interest while showing Pong Doubles and Gotcha. Newsweek called Bushnell â€œKing Pongâ€. Bushnell told the magazine, â€œWeâ€™ve created a whole new marketâ€. Players liked Pong because no luck was involved and the more you played, the more skillful you became. Bushnell described Atariâ€™s successful process for game design as, â€œWe have to walk a tightrope between reward and frustration.â€ At this time, Atari also acquired one of their most infamous employees: Steve Jobs, who was hired as an engineer by Al Alcorn (As an aside, Appleâ€™s other famous father, Steve Wozniak, was never an employee of Atari, but still hung out there and made stuff â€“ed.). 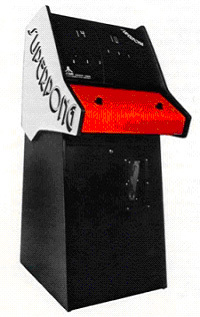 By the end of 1973, Midway had sold 9,000 Pong-type machines over Atariâ€™s 6,000. Atari was now up against the big boys, and they werenâ€™t about to give the fledgling company any credit: â€œThe small companies will be in trouble when the crunch arrives,â€ said Jack Mittel, Vice President of Sales for Williams Electronics. However, Atari was still trying to push Pong in directions that the competition had never considered. Some of these ideas included prototypes, limited-run and unreleased versions of Pong such as Barrel Pong, Dr. Pong and Puppy Pong. Barrel Pong was a version of Pong created by Atari with a cabinet that looked like a barrel, with a screen on-top and controls on either side (Could this be considered the first cocktail cabinet? -ed.). Possibly one of the most unique and bizarre games Atari (n)ever created was Puppy Pong. 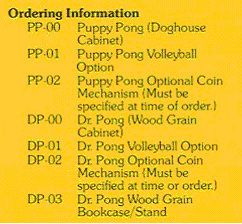 Puppy Pong was basically an Atari Pong without a coin box packaged into a very cute little table top wooden cabinet. The game was tested at Chuck E. Cheeseâ€™s in the mid-1970â€™s, but never officially released. According to Atari Historian, Curt Vendel, â€œDue to legal issues from Charles Shultz, the creator of Snoopy, Puppy Pong was tested in Pizza Time Theatre's, but never soldâ€. Regan Cheng, the industrial designer for the Puppy Pong cabinet describes the game this way, "The Puppy Pong was originally conceptualized by Nolan Bushnell, Steve Bristow and various marketing guys. The original idea was Snoopy Pong for which I designed a red dog house cabinet with Snoopy on top as you see in the comicsâ€. The flyer for Puppy Pong proudly announced the game to the world like this: â€œHereâ€™s a friendly puppy and his doghouse with a familiar game of Pong insideâ€. The pamphlet described the operation of this product this way: â€œWhen you sense your visitors (or your own staff!!!) want variety, simply replace the Pong circuit board with the Volleyball circuit boardâ€. Essentially, Atari had created the first arcade system with interchangeable games. Sadly, none of this ever reached the public. Competition was just one of Atariâ€™s worries; manufacturing issues had also become a problem. Assembly line quality was terrible and $800 a day in equipment was lost to theft. The line workers were not happy and complained of low wages even though their $1.75 an hour was actually above the minimum wage. Bushnell hired outside managers to help solve these problems, but this only led to further unrest between labor and management. Bushnell was an engineer at heart and the details of being company president were bogging him down. Bushnellâ€™s concentration on engineering meant that while labor might have been problematic, R&D and engineering were still in good standing. Designers and engineers were having a blast designing and testing new games. They had â€œrip-roaringâ€ brainstorming bashes at places like hotels and a condo complex where 40 people would get together and discuss ideas for games. Bushnell saw engineering as the core value of his business and made moves to bolster Atariâ€™s engineering capacity even further. He contracted with ex-Ampex employees, Steve Mayer and Larry Edmonds, who were running a high-tech facility in Grass Valley. Atari started an exclusive relationship with this pair of engineers and the facility became known as the â€œGrass Valley Think Tankâ€. 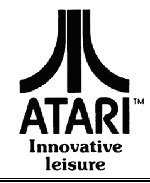 January 30, 1974: Atari started using the term â€œInnovative leisureâ€ to describe their business. They would file to trademark this term in April 1976, and be granted that mark in February 1977. Superpong was a one or two player contest. This game was an evolution over Pong that used variable ball speeds, angles and three paddles (vertically aligned) for each player. To further spice-up the game, the ball was served from random positions on the screen. Atari described Superpong as â€œnot easily masteredâ€, but since it is a relatively unknown game, it was probably too hard at a time where ball and paddle games were losing their appeal. Pong competition was too fierce at this point in the coin-op world for Superpong to make any sort of impact. The hardware featured a discreet logic design and was advertised as Durastressâ„¢, as well as marketed with Atariâ€™s Innovative leisureâ„¢ slogan. Rebound was Atariâ€™s fourth coin-op game and was a simple version of volleyball that required two-players. Steve Jobs signed off on the wiring diagram for the cabinet. A schematic dated 11/31/73 describes this game as â€œVolleyballâ€. 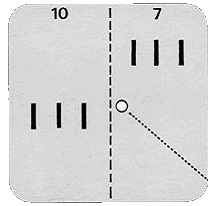 The game was like a vertical version of pong in which hitting the ball would send it on a parabolic path over four short lines that represented a net. The hardware featured a discreet logic design and was advertised as Durastressâ„¢, as well as marketed with Atariâ€™s Innovative leisureâ„¢ slogan. Rebound was also featured in an unreleased variation on Puppy Pong named Puppy Pong Volleyball. The game used the same cabinet as Puppy Pong, but used the Rebound game. 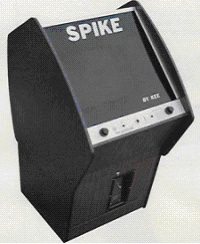 Spike was a copy of Atariâ€™s Rebound. Like most Kee games, features were added to slightly differentiate them from their Atari cousins. In this case, the â€œSpikeâ€ button was added. Quadrapong was a two- to four-player table-top, look-down cabinet. Each player was given four points and tasked with defending one side of a diamond-shaped screen. Players lost a point each time one of the others score in his goal and was eliminated if this happened four times. At that point, the goal was sealed and became a solid wall. Hardware was a discreet logic design, advertised as Durastressâ„¢ and marketed with Atariâ€™s Innovative leisureâ„¢ slogan. 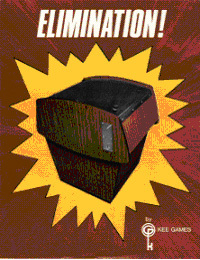 Elimination, from Kee Games, was a copy of Atariâ€™s Quadrapong from Kee Games. Like most Kee games, features were added to slightly differentiate them from their Atari cousins. In this case, â€œextra life potsâ€ are randomly placed on the playfield and the player who hits the ball into one gets a point added back to their score. Gran Trak 10 was the first driving coin-op videogame with a steering wheel, gear shift, and gas and brake pedal controls. It was also the machine that could have ended Atari before they ever really got started. The game was a race against the clock on a single track and there were no other cars except for the playerâ€™s. Oil slicks made the playerâ€™s car spin-out and the side of the track had to be avoided at all costs. This was a very simple version of many racing games to come. ROM memory was used (in the form of diodes) to store the sprites for the car, track and oil slick. Atariâ€™s new Grass Valley (Most appropriately named at that time. -ed) think tank was used to design the game, but Atari proper was disappointed by engineering flaws in the original design. Al Alcorn had to step in and fix the game before it went into production. This fix created costly rework and delays for the game. Worse, an accounting error had Gran Trak 10 selling for $995, when it cost $1095 to manufacture. Because of these problems, Atari lost $500,000 on Gran Trak 10, which was as much as the company had made the previous year. 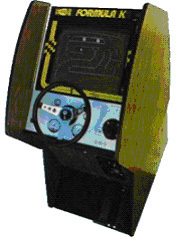 The European version of the game was called: Race Circuit Automaten. The game was advertised as Durastressâ„¢ and marketed with Atariâ€™s Innovative leisureâ„¢ slogan. 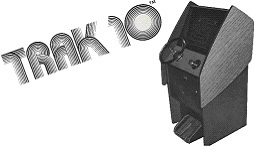 Later in 1974, Gran Trak 10 was repackaged into a smaller cabinet and renamed Trak 10. The game cabinet was designed to fit into the smaller spaces that small bar, grocery store and laundromats could set-aside for games. Atari loses $500,000 in 1973 - 1974 (mostly from the Gran-Trak 10 problems) and cuts half of its staff. Pong games had stopped selling and Bushnell started to look like a one-trick pony. He needed to turn-the-company around with a hit game and some engineering innovations if Atari was going to survive. In the summer of 1974, Atari was close to bankruptcy and very under capitalized. The company tried to grow too quickly. Atari Japan, set up in 1973, was a complete failure. Bushnell had no idea how to conduct business in Japan. He sold Atari Japan to one of the founders of Namco. The relationship between the two companies would continue for almost two decades. 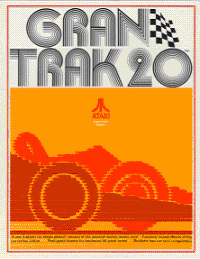 Formula K was a one player racing game from Kee games that was a copy of Gran Trak 10. 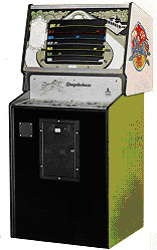 The game featured a different cabinet than Gran Trak 10 and added a new â€œLap Timerâ€ feature. Hardware was discreet logic, with ROM used for car and oil slick graphics. No notes are available on how profitable Kee was at this time. This was a one player only soccer-themed Pong-style game released by Atari Europe. This game was sold in both upright and table-top models. Hardware was discreet logic. Gran Trak 20 was a one or two player version of Gran Trak 10 designed at Grass Valley and fixed by Al Alcorn. 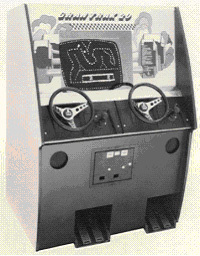 This game featured two complete sets of controls (steering wheel, brake pedal, gas pedal, four speed gear shift) and used a black and white screen. The game can be played one or two player, but the two player feature required one quarter per participant. If a player obtained a score of 40 or more, they were awarded a free game (both players if two were playing). However, reaching 40 points on your free game would not extend play another time. The final date signed-off on engineering documents is August 26, 1974, but the gameâ€™s release to the public was later in the year. The hardware was discreet logic, with diode-based ROM used for the car and oil slick graphics. The game was marketed with Atariâ€™s Innovative leisureâ„¢ slogan. 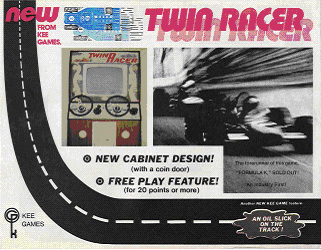 Twin Racer was a one or two player Kee Games copy of Gran Trak 20. This game added the new feature of the â€œram effectâ€, which allowed you to knock your opponent off the track. Free play was awarded at 20 points instead of Gran Trakâ€™s 40. Another Kee Games â€œinnovationâ€ with this game was the â€œAutomatic Drive Buttonâ€, which was advertised as â€œfor ladies and kids â€“ must for arcadesâ€. The hardware was discreet logic with diode ROM used for car and oil slick graphics. Pin Pong was a one or two player black and white video pinball game, with a rather crude table. The Pin Pong flyer describes the game as: â€œIn Pin-Pong a gravity algorithm accelerates the ball downward to give realistic pinball action on the screenâ€. The ball movement within the game was governed by a patented ball movement circuit. The hardware was discreet logic. 1974: November 5: Kee Games Introduces Tank! The importance of the game Tank! in the history of Atari cannot be understated. It was the game that saved Atari from bankruptcy in 1974. 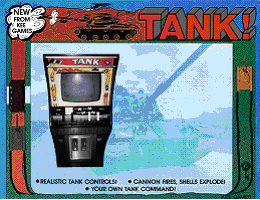 The arcade version of Tank! 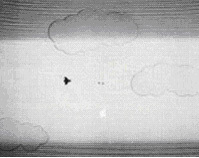 is a two player tank combat game played on a black and white screen. It was very similar to one of the most popular modes of the Atari 2600 Combat cartridge: two player tank combat. Players each used twin joysticks to control their tank (Think of the Battlezone arcade control setup, but side-by-side for two players. â€“ed.). The game became so popular that the exclusivity agreements demanded by distributors were thrown out the window, allowing Atari and Kee to re-form as one company. The game was designed by Steve Bristow and Lyle Rains at Kee Games, with Lyle doing much of the programming. "I was working on it when I hired Lyle," Steve Bristow recalled, "Then I gave it to him and he finished it. A lot of the implementation was his, but the original idea was mine." The Game cabinet was designed by Peter L. Takaichi and patented October 20, 1975 (US Patent # D243,624). Tank! is one of the first arcade games to use IC ROM read-only-memory as well as discreet logic chips. The ROM enabled the game to have distinct looking sprites to represent the tanks in the game. Gran-Trak 10 from the same year also used a ROM, but in a very primitive form that used diodes to store the ones and zeros. 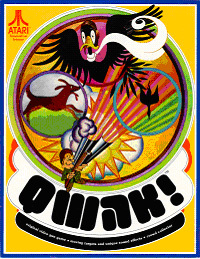 1974: November 5: Atari Introduces Qwak! Qwak! was a one player light-gun controlled duck hunting videogame with a black and white monitor. The gun was shaped like a rifle with a security mechanism that would sound an alarm if it was stolen. This was not likely as it used a metal flex cord similar to a pay telephone handset cord to attach the gun to the cabinet. One duck would fly across the black and white monitor at a time, giving the player three shots to hit it. A "hunting dog" would run out and collect the fallen prize if the player was successful with their aim. The game could be set by the operator to have time limits, extended time and free games. Hardware was a discreet logic design, advertised as Durastressâ„¢ and marketed with Atariâ€™s Innovative leisureâ„¢ slogan, with the added tagline: â€œThe skyâ€™s the limit when it comes to our inventivenessâ€. Touch Me was a one player, discreet logic coin-operated game that was played without a video screen. Colored lights, aligned in a row, lit-up in succession. The player was tasked with memorizing the pattern, so they could repeat it. The game was very much like the handheld game Simon that would appear years later. Interestingly, Atari tried to combat Simon with a handheld version of Touch Me, but it was an unsuccessful venture. 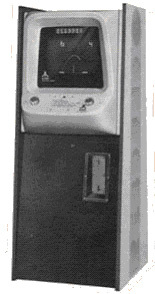 Atari introduces the COMPUGRAPH FOTO, a coin-operated machine that printed life-sized pictures on computer paper for customers. The machine weighed-in at an astronomical 950 pounds! It contained a combination of impact line printer, computer and closed-circuit TV. It was advertised as Durastressâ„¢, with apparently several patents applied for, but little else is known. 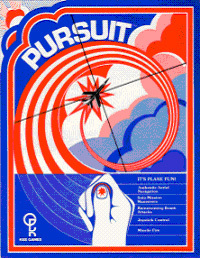 Pursuit was a one player World War I flying game where you shoot-down enemies in your crosshairs. Controls were an analog joystick with a single button for firing at enemies. The game had operator settings for several options, including extended play. Pursuit was advertised by Kee Games, but Atari handled all the distribution. At this point, Kee and Atari were no longer hiding the fact that they were the same company. Pursuit was still a discreet logic design, with the game was advertised as Durastressâ„¢ and marketed with Atariâ€™s Innovative leisureâ„¢ slogan. Production release of the game was December 17, 1974, but it shipped in January of 1975 according to the January 31, 1975, US Trademark First Use In Commerce date. 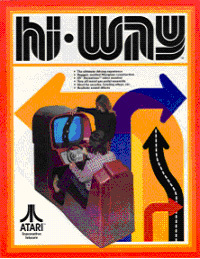 Hi Way was Atariâ€™s horizontal scrolling driving game that came in a unique sit down cockpit-like cabinet. The playerâ€™s goal was to dodge cars and negotiate turns down twisting road. The hardware was a discreet logic design, advertised as Durastressâ„¢ and marketed with Atariâ€™s Innovative leisureâ„¢ slogan. The unusual sit-down cabinet was patented October 20, 1975 (U.S. Patent # D243,626). In Europe, the game was named Highway from Atari France, but was only released in a standard cabinet. Production release was on March 11, 1975 (according to the service manual). 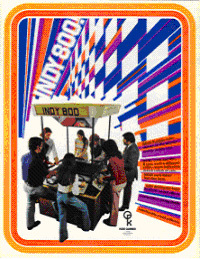 Indy 800 was an eight player racing game with a full-color screen. The game resembled Gran Trak 10, but allowed for eight players at a time. An Optional control module would allow an official starter to facilitate tournaments. The cabinet included a mirrored canopy to allow spectators to view the racing action. Besides a steering wheel, shift and pedals, each driver had their own horn to honk at will. The game hardware was a discreet logic design, advertised as Durastressâ„¢ and marketed with Atariâ€™s Innovative leisureâ„¢ slogan. The major innovation with this game was its color monitor and eight player multi-player cabinet. The cabinet was so large in fact, that it required at least 16 square feet of space! 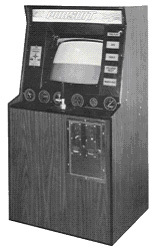 The game cabinet was patented October 20, 1975 (U.S. Patent #D243,625). Production release for the game was March of 1975. 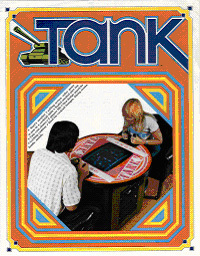 Tank was such a hit that the newly reformed Atari/Kee released several more versions of the game throughout 1975, including Tank 2, Tank III and a cocktail table version of the original Tank. Tank 2 added land mines represented by xâ€™s. All the games still featured discreet logic hardware with ROM to represent the tanks and other objects. The advertising for all of these games said that each game was released by Kee Games, but now added â€œA Wholly Owned Subsidiary of Atariâ€. All games were advertised as Durastressâ„¢ and utilized the Innovative leisureâ„¢ slogan. Atari's sales reach almost $40 million. Anti-Aircraft was a one or two player game that would one day form the basis of the Atari 2600 cartridge Air-Sea Battle. Players used a gun that could rotate to three positions and attempt to shoot down aircraft that flew overhead. An undocumented switch could turn the planes into UFOâ€™s. The hardware used was discreet logic printed circuit boards with ROM for the planes and guns. Atari continued to tout its solid state manufacturing with Durastressâ„¢ with the release of this unit and was marketed with Atariâ€™s Innovative leisureâ„¢ slogan. The final engineering sign-off for the game was June of 1975. The game is also known as Anti-Aircraft II, but apparently is the exact same game. Goal 4 was a one to four player Pong-style game built into a cocktail table (one of the first for Atari) that allowed up to two people per team to sit down, rest their drinks on the game table and battle it out with Foosball-style play. 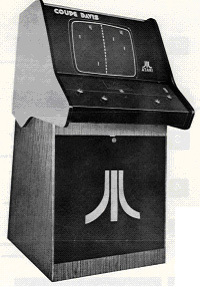 On September 17, 1975, Atari filed a U.S. Patent for the Goal 4/Breakout Sit-Down Game cabinet ornamental design. 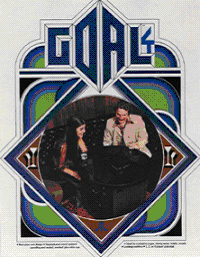 Goal 4 was marketed as utilizing Durastressâ„¢ with Atariâ€™s Innovative leisureâ„¢ slogan. The game utilized discreet logic printed circuit boards. 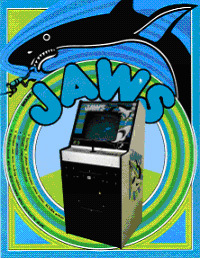 Shark Jaws was a one player game designed to capitalize on the movie Jaws. Legend has it that Atari tried to secure the rights to the movie, but failed. 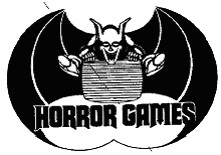 Instead of potentially jeopardizing Atari, Bushnell created â€œHorror Gamesâ€ specifically for this release and marketed it anyway. The game was very simple, consisting of a swimmer, fish and shark. The swimmer had to catch the fish, without being eaten by the shark. The monitor was black and white, but used a color overlay on the screen. The game was solid-state, utilizing discreet logic, with ROM chips to create the shark, fish and swimmer graphics. The promotional materials touted both Durastressâ„¢ and the Innovative leisureâ„¢ slogan. Steeplechase was a horse racing game for one to six players. The player controlled the jumping of the horse as it moved steadily along the race track. 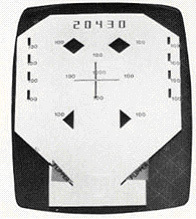 Colored overlays were used for each lane (Atariâ€™s recently designed color monitor was not incorporated). The game hardware was a discreet logic design, advertised as Durastressâ„¢ and marketed with Atariâ€™s Innovative leisureâ„¢ slogan. The game was designed and programmed by Lyle Rains (Steeplechase was a Sears exclusive for the Atari 2600 and supported up to four players. No â€œofficialâ€ Atari home version exists. â€“ed.). Crash â€™n Score was a one or two player game in which the goal was to run over as many randomly placed, numbered pylons as possible in the time allotted. Players could choose to play with or without barriers. 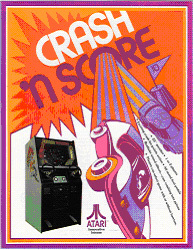 The Atari service manual described the game like this: â€œAtariâ€™s Crash â€™n Score is a video action game in which one or two players drive race cars on a rectangular playfield and earn score points by driving through lighted score flags. During play a player has to maneuver his car around certain obstacles and has to avoid the opponent car.â€ A modified version of the game was released in Europe under the name Stock Car. Hardware was a discreet logic design, advertised as Durastressâ„¢ and marketed with Atariâ€™s Innovative leisureâ„¢ slogan. 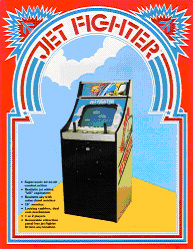 Jet Fighter was a two player game that inspired one of the popular modes of the Atari 2600 Combat cartridge. Jet Fighterâ€™s service manual for the game described play like this: â€œAtariâ€™s Jet Fighter is a video action game in which players pilot two airplanes across the sky in a fast-moving duelâ€. The hardware was a discreet logic design that was advertised as Durastressâ„¢ and marketed with Atariâ€™s Innovative leisureâ„¢ slogan. On October 20, 1975, Atari filed a U.S. Patent for the Jet Fighter game cabinet ornamental design. The second production release was September 30, 1975. The game was designed and programmed by Lyle Rains. Atari started its own pinball division with the idea to make solid-state pinball games with pure electronic components. Gone would be the mechanical scoring and electro-mechanical parts that were part of the so elegant, yet so expensive to maintain classic pinball machines. However, this type of innovation would require more solid engineering personnel than Atari possessed. Atari decided to expand its in-house engineering team by buying the â€œGrass Valleyâ€ think tank that they had been contracting with since 1973 and incorporated it into their own R&D operation. They started their pinball division with five people in 1975, but would not see any pinball game releases until November 1976 with the Atarians table. As 1975 came to a close, so did Atariâ€™s sole reliance on its coin operated games division. Christmas 1975 thrust Atari into the consumer product arena with the C-100 Pong console. The seeds of this console were sewn as far back as 1973. That was when two Atari engineers, Harold Lee and Bob Brown, discussed the idea of creating a stand-alone version of Pong on a single microchip. The idea was radical for Atari, which was then creating its coin-op videogames with discreet logic chips on printed circuits boards. The two sold Al Alcorn and Nolan Bushnell on the idea and set out to create the console. By the fall of 1974, Al Alcorn had joined Harold Lee and Bob Brown in working on the home version of Pong, now code named â€œDarleneâ€. The cost of microchips had come down to a level that would make the project economically viable. Bushnell decided it was time to make the jump to the home market, even though most of his advisors told him to stay focused on coin-ops. Atari attempted to sell home Pong, but almost all traditional retailers refused. The only interested party was Tom Quinn, the sporting goods buyer for Sears. He ordered 50,000 units and then increased the order to 150,000 by Christmas. The problem was Atari was still in financial jeopardy. Bushnell enlisted the aid of Donald Valentine to help secure venture capital. Valentine came through with $600,000 in the summer of 1975, and another $300,000 in December, which was enough to help get home Pong manufactured. Home Pong became a surprise hit for Atari. The Sears deal infused them with some much needed cash and generated $40 million in gross sales and $3 million in profit. This success made Atari the first company to manufacture games for both the arcades and home consumers. This would have huge repercussions on the future of Atari and their games as they moved into 1976. While Atariâ€™s output from 1971 - 1975 might seem inconsequential at first glance, a closer look shows quite a different story. The games might not have been memorable enough to change history and keep the masses in the arcades, but the hardware innovations proved to be immensely important. From the pure discreet logic chip designs of the very first Pong games, to the addition of ROMâ€™s for more complex graphics, and from simple control knobs on a two-player cabinet to eight-player driving games with realistic controls and a color monitor, Atari pushed the hardware of the coin-op videogame in every direction. While some of the games ranged from the mundane (Superpong, Pong Doubles) to the exceedingly odd (Shark Jaws, Qwak! ), many titles (Tank, Jetfighter, Anti-Aircraft, Indy 800) laid the groundwork for many later products. The creative coin-op game designs and technical innovations from these early days became the forbearer of Atariâ€™s future success, especially with home Pong. In the coming years, Atari would go on to create some of the most memorable coin-ops the world had ever seen and eventually change the home videogame industry forever with the Atari 2600. The REAL "PONG" F.A.Q. by Sly D.C.